Is BART Getting the Density Equation Wrong with Coliseum Station Project? Are townhouses the right density for station-area development in Oakland? Image: BART. Tomorrow, Thursday, January 28, the BART Board of Directors will review environmental documents for Phase I of the proposed Coliseum Transit Village, which will bring 110 housing units to a parcel that’s in walking distance of the Coliseum station. The hope is construction will start in November of this year, with completion two years later. Right now, this BART-owned parcel, bound by Snell Street and 71st Avenue, is surface parking. Oakland has pushed for development in the area for over a decade—and encountered quite a few problems. But this stage of the project could be close to breaking ground, depending on the BART Board’s decision. Isn’t it better to have new development around the station? Josefowitz doesn’t think so, because once those town houses are built, it’ll be nearly impossible to add density later. “Taking a step in the right direction doesn’t help if you’re trying to run a marathon—which is the scale of our housing problems—and that step prevents you from running the rest of the marathon,” he said. But just five-story buildings are enough to provide remarkably pedestrian friendly, accessible neighborhoods. Think of the height limits in Paris (although those show signs of loosening up). Advocates for sustainability say it’s not about getting too bogged down in height limits and density overall, but instead about finding the right kind of density for the site, as Kaid Benfield writes about in the Switchboard Blog for the Natural Resources Defense Council. The Urban Land Institute (ULI) has 10 Principles for Livable, High-Density Cities: they include prioritizing green transportation and building options to reduce energy consumption; clustering the highest density housing close to a transit station falls under that category. 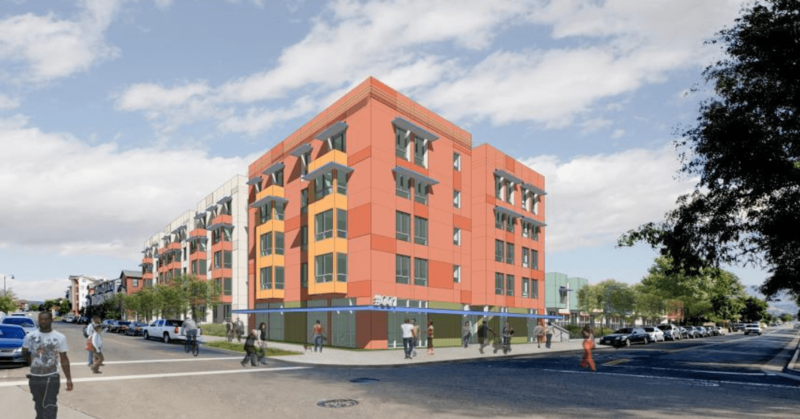 As does fostering affordable housing, which the BART transit village aims to achieve. On a related point, it’s disappointing to see that even in the transit village project renderings, there’s an image of a cyclist slapped on, but no apparent bicycle infrastructure. Josefowitz hopes there will be plenty of bicycle parking and pedestrian features, such as greenways and good lighting. On-street bike lanes, he hopes, will follow. Parking that’s lost for the development, meanwhile, will be shifted to other parcels around the station. The BART board meeting, which takes public comment, is held in the Kaiser Center 20th Street Mall, Third Floor, 344 20th St., Oakland, CA. It starts at 9 am. It’s a 50,000 square foot lot. Yes, a walkable neighborhood needs retail, but you are never going to fit housing *and* “grocery stores, banks, nurseries, and other neighborhood retail” *and* whatever parking requirements the city has insisted upon into that space. And I’m sure the townhouse component is not because that’s what the developer really wants, but is instead to keep the neighbors on the other side of the site from flipping out about tall buildings. For this site, you can’t have everything. You have to choose, and I say go you should go ahead with the plan that people have already been working on for years rather than hoping that something better will come along eventually. It’s rare to hear someone elected to a short term thinking about the long term. Building just the high density part sounds really sensible. If they’re worried by the neighbors, it might be a good idea to consult with the architects behind the Mission-Meridian Village in South Pasadena to perhaps get some pointers about hiding stuff. That project does a pretty good job of transitioning from the SFR community to the mixed-use development, though there aren’t five-story buildings either. The BART Board of directors spent two and a half hours this morning debating and hearing from staff and constituents about a proposed $1.6 billion extension of the Dublin/Pleasanton branch to Livermore.